Pope Francis goes to Confession during a penitential celebration at St. Peter's Basilica, March 28, 2014. Credit: Ansa/L'Osservatore Romano. 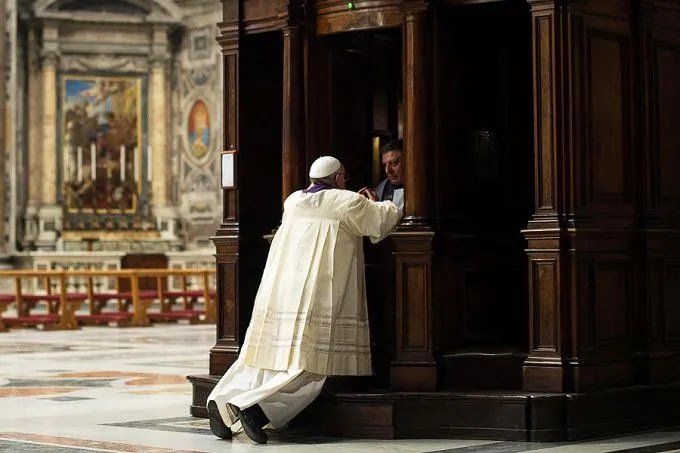 Vatican City, Jan 13, 2016 / 12:08 am (CNA/EWTN News).- God's love is offered to everyone who goes to the sacrament of confession, Pope Francis said in his new book on mercy – even those who are not able to receive absolution from their sins. “If the confessor cannot absolve a person, he needs to explain why, he needs to give them a blessing, even without the holy sacrament. The love of God exists even for those who are not disposed to receive it." He recounted how the man, despite having remarried without an annulment, nonetheless went to confession every Sunday before Mass, telling the priest, "I know you can't absolve me but I have sinned … please give me a blessing." "This is a religiously mature man," the Pope said. The Pope then turned his attention to the confessor, saying he should emulate God's mercy.